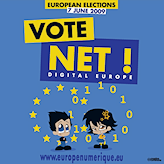 Digital Europe: Internet, liberty and European elections. 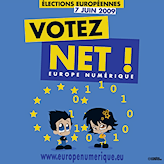 Paris, 26 May 2009 - European citizens are questioning the candidates in the European elections about respect for fundamental liberties on Internet. Network neutrality, "graduated response", content filtering and authors' rights in the digital age are questions of burning interest in the news now in France and all Europe. Now when the campaign for the June 7 elections is getting under way, the candidates are invited to respond to some simple questions on these topics, which are so fundamental for the future of European societies. Many Internet using citizens have discovered how representative democracy works in the turbulent and controversial public debate over the Telecom Package in Europe1 and the HADOPI law2 in France. Questions about protecting the authors' rights, the place of digital technologies in our networked societies, and of protecting civil liberties in the digital age have become crucial. They are structuring the future of our economy, of our culture, and of our European societies. Citizens aware of the importance of the European Parliament and of its members who will be elected next 7 June 2009 have drafted a short questionnaire to find where the candidates stand. The heads of lists and all other candidates in eligible position are invited to give yes or no answers to four questions, and, if they wish, to elaborate on their positions. "The turbulent debate over the European Telecom Package and the French HADOPI law have shown how fundamentally and structurally important are these questions of individual liberties in the digital age. Right now, when so many are uninterested in the June 7 election and in European institutions generally, it's urgent for the candidates to reassure our fellow citizens by taking clear positions on these matters" declares Julien Rabier, spokesperson for the Digital Europe initiative. The citizens' initiative created for this occasion invites every citizen who holds fast to freedom to take this questionnaire, to meet their candidates, and to ask them to respond. Digital Europe is an informal group of citizens concerned with liberty who want to gather the opinions of candidates in European elections on fundamental questions of individual liberties in the digital age. Anyone may participate by sending the questionnaire to his candidates and by contacting them to get a response quickly. All the French responses will be published and analysed several days before the vote. Contact us so we can link to the website where you will publish the responses for candidates in your Member State.